We started off the week with a date night to Rudee’s with Blair and Ty, whose little one Alexis is due in just 4 weeks! We sat outside in the swinging cabana tables and enjoyed dinner overlooking the sunset. It’s fun to have another couple (we actually have a few!) who we can talk with about the experiences of being pregnant and having a baby on the way so soon. It’s been so fun to be able to walk through this part of life with them and now that all of our conversations are about babies and diapers, it’s nice to have people in our lives who don’t get annoyed by it. 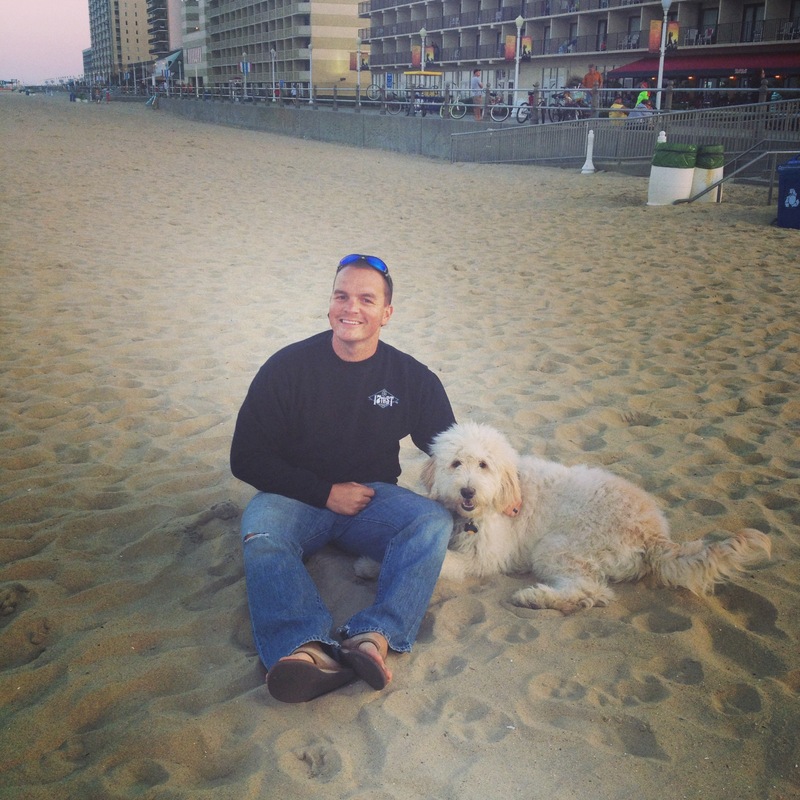 We also enjoyed one of our last nights out on the beach with the puppy. 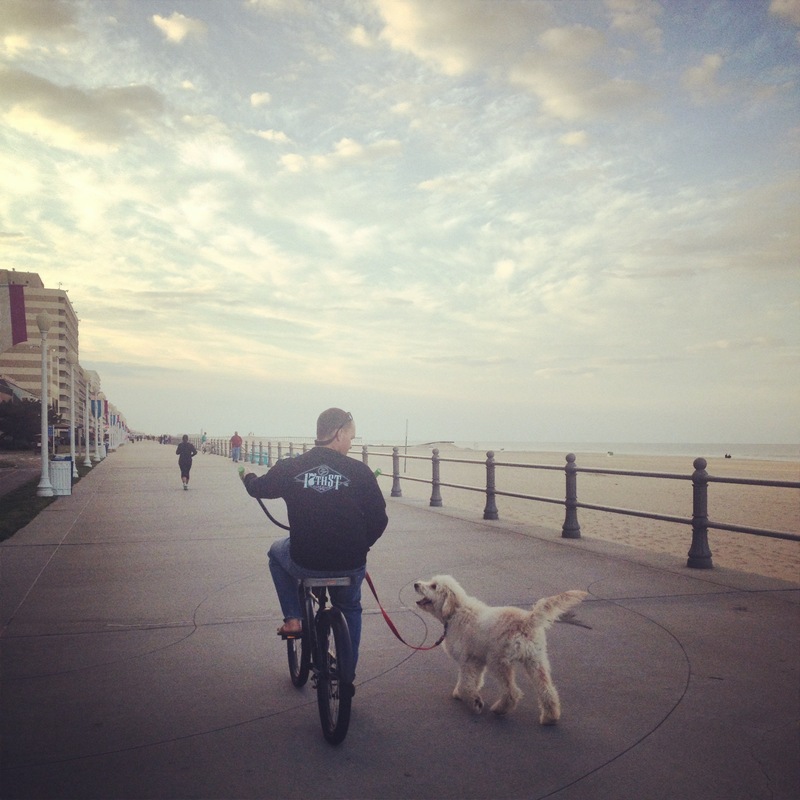 New beach laws keep dogs off the beach and boardwalk from Memorial Day through Labor Day so we’re trying to get in puppy beach days and nights while we can! We took him down to the beach, played fetch a while, and he sat just in front of the wall while we ate dinner and listened to live music at Chix. 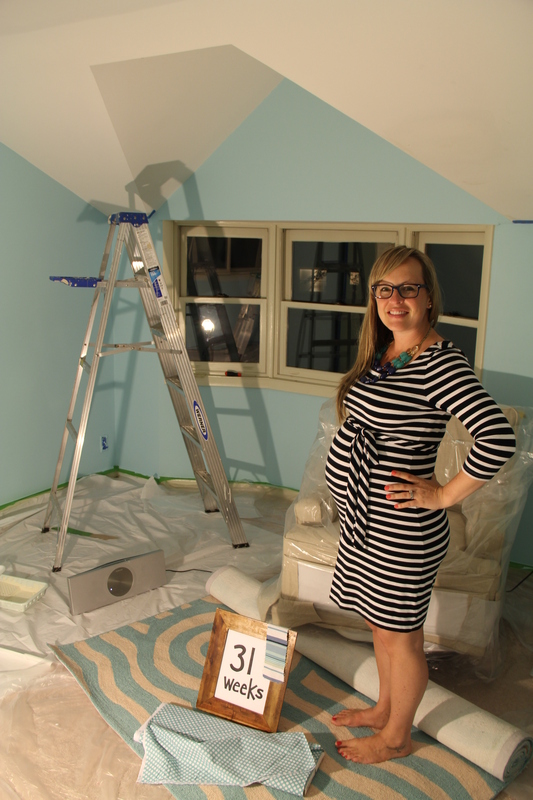 And the biggest development of the week was painting the nursery! Blake has been SUPER busy this week with shifts at the fire station and various landscaping jobs so my parents and I decided to surprise him by painting taking off one of the big items on his To Do List. Mom and Dad came over one evening after I got off work, we ate a quick dinner, and immediately went to taping corners, laying plastic sheets, and prepping our paint supplies for a long night of painting. We chose a light turquoise color to go with our surf/wave theme. And thankfully it only took two coats of paint to cover up the dark teal! It was fun to finally see Brantley’s room start to look more and more like the nursery we envision rather than the unused office/storage room it’s been for so long. Bringing new life to this old room! Can’t wait to see it with furniture and baby toys!